Ghanaian shoemaker and Chief Executive of E-Cash Shoes, Yaw Barimah Agyapong Addo has been rewarded for his achievements in Ghana. 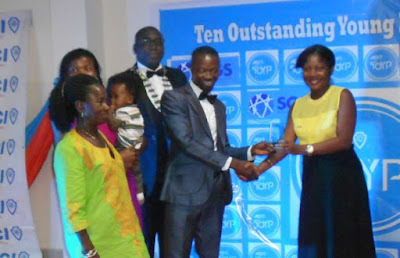 Mr Addo, who started his career as a cobbler, was presented with an award for entrepreneurial accomplishment at the just-ended Junior Chamber International (JCI) Ghana Awards, which took place in Accra over the weekend. E-Cash Shoes, which was established in 2005, manufactures shoes that can compete with those produced by the likes of Louis Vuitton and Salvatore, among others. Mr Agyapong Addo, after receiving his award, commended the organizers for recognizing his achievement in the Ghanaian shoemaking industry and pledged to work hard. Speaking at the awards night, Albert Ankrah, the outgoing president of JCI Ghana, said the sole aim of the event was to reward young people who had embarked on various projects to help transform society. Mr Ankrah called on the youth to be innovative and undertake projects that can address some developmental issues in our societies. According to him, young people must address some developmental issues that would help shape society. “By recognizing these people, JCI encourages them to seek excellence and serve others. We believe in improving the world around us. The association hopes to unite and bring on board stakeholders from all areas to create a positive impact on society,” he stated. The outstanding young personalities, who were below 40 years, were recognized for their innovation in their chosen fields. Mabel Simpson, a fashion designer, who uses local textile prints to manufacture various accessories, received an award in the cultural achievement category while Nana Adjoa Sarfo, President of Direct Impact Foundation, was rewarded for helping rural children improve their reading, speaking and computer skills. Other awardees were Raindolf Owusu, a software developer, John Armayh, Richard Dugan, Regina Agyare, Prince Adu-Appiah and John Stephen Agbenyo. He added that society should not expect benevolent bodies to always address developmental challenges, but the youth must be innovative and collaborate to undertake projects that would yield good results. Mr. Ankrah noted that the sole aim of the association is to identify social challenges and mobilize support through grassroots participation to find solutions. The Ghana Country Director of UNAIDS, Girmay Haile, also urged the youth to participate actively in projects to develop themselves and their communities.